BRIAN CARLIN was a member of the Santa Barbara Mac Users Group [now SBAUG], and a true Apple Evangelista, who suddenly passed away in 2008. Brian was a generous and kind person, and his loss was felt by the whole club [SIC organization]. He was a nerd of the best kind and graduated from Dos Pueblos High School, then worked at Apple in Cupertino for some years. To honor his memory, the members of SBMUG set up the Brian Carlin Memorial Fund, and last night presented Dos Pueblos High School with 16 Apple TVs for the class rooms, and a $1,500 cheque for their Engineering Academy and their robotics program. The latter donation will go to a matched fund, so the Academy will benefit to the tune of $3,000. 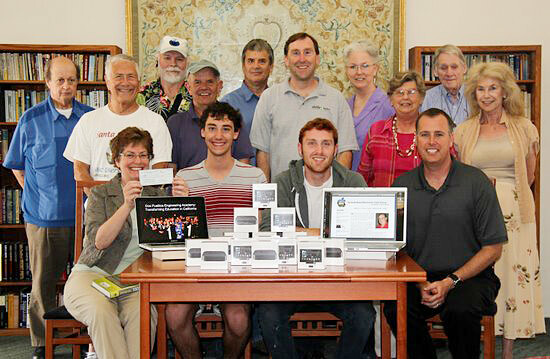 Seen above are Sandy Seale (left) receiving the cheque for the Engineering Academy, and Todd Ryckman, Computer Services (right) beaming at his 16 Apple TVs with the Santa Barbara Mac Users Group board members behind. The two young men in front are graduates of Dos Pueblos High School. Brian was also very fond of cats in general, and his own kitty in particular. 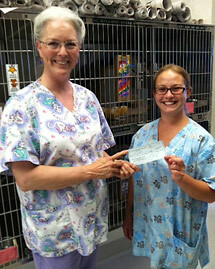 As we wanted to honor this as well, SBMUG donated $200 to Animal Shelter Assistance Program (ASAP), a volunteer-based, non-profit organization that provides humane care for the cats and kittens at the Santa Barbara County Animal Shelter. Thanks to all the Donors!! Marjorie Wilser (L) presents a check to Kaitlyn Stewart, Board Member of ASAP. Click HERE to view a small collection of photos of Brian with his friends. WE have been trying to figure out how to best memorialize Brian since he died. He touched so many people in the club [SIC organization], and had so many best friends, that many people wanted to contribute. In fact, there were more ideas than we knew what to do with, and some strong opinions. We have finally settled on something that we can all agree on: A contribution to the Dos Pueblos Engineering Academy and Dos Pueblos High School teaching programs in Brian’s name, and secondarily to Animal Shelter Assistance Program (ASAP), a volunteer-based, non-profit organization that provides humane care for the cats and kittens at the Santa Barbara County Animal Shelter. Brian was a DP graduate and he almost certainly would have been a big force in their Engineering Academy had it existed in his time. He was also very fond of cats in general, and his own kitty in particular, so we wanted to honor this as well. The Dos Pueblos Engineering Academy is a school program within the DP curriculum in which students receive class credit and the teachers are paid by the school district — in other words, this is not an after-school club. As it happens, the DPEA has an offer of matching funds for donations made up until the beginning of July, so whatever we give to this will be doubled. In addition, we have found a second very worthy donation at Dos Pueblos. There exists a goal of putting a flat screen TV in each classroom, equipped with an Apple TV that allows teachers AND students to project material from their own wireless devices, such as iPads and iPhones, to the entire class. This is a far cry from the olden days, where we had clunky 16mm film projectors wheeled in on a cart from the AV room. Dos Pueblos has NO budget for Apple TVs, and we would dearly love to donate some in Brian’s name. An example of something that actually happened in class is this: In a discussion about the Suez canal, a student asked “Where is this canal anyway?” The teacher called up the World Atlas HD app on his iPad and showed it. Then someone asked “What does it look like?” and he switched to satellite picture mode. Next someone asked “How does it work?” and the teacher found a web site that showed that. All in a couple of minutes. Other types of content that could be displayed are slide shows, video and other things created using computers, iDevices, etc. Coupled with this is the AVID Program that mentors students who will be the first in their families to go to college (they are batting 1000 so far). These students have an opportunity to buy their own iPads (over time) and use them to create their own “stuff” to contribute in class. So you see, we have so much that we want to do. In this light, the board has voted to have our own challenge: Donations made between now and the end of our campaign on June 30 will be matched by the club [SIC organization], up to $1000. So, your contribution will be doubled (or quadrupled, for the portion going to DPEA). In addition, contributions by SBMUG and others to Dos Pueblos High School will be matched by local resident Virgil Elings. If you want to specify where your donation will go — to the Engineering Academy, the classroom Apple TV project, or Animal Shelter Assistance Program — make your wishes known and we will abide by that. Questions and comments? Write to us!